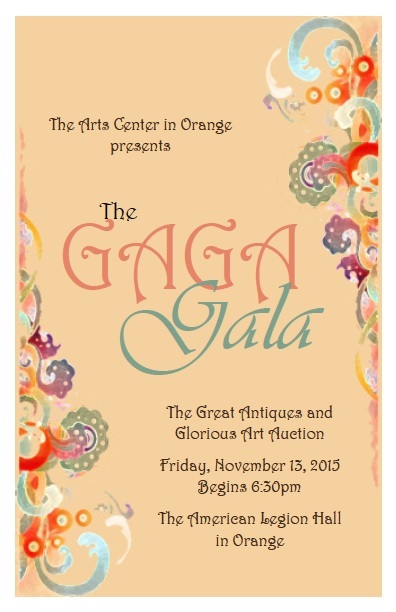 The Arts Center In Orange invites you to go GAGA for the ARTS at the Great Antiques and Glorious Art Gala and Auction on Friday, November 9, 2018 at The American Legion Hall in Orange. Auction items will include fine antiques from local attics and small work by fine Virginia artists, as well as some useful and ridiculous offerings. Cocktail hour begins at 6:30 pm and closes when everything is sold. The evening’s music will be performed by The Kenwood Players. And, lovely food will be offered by Real Food. GAGA Gala Tickets are $50 per person. All proceeds benefit The Arts Center In Orange a non-profit corporation 501(c)(3). Your contribution is tax deductible to the extent of the law.